VA-THERM profiles are system profiles of the latest generation with a thermobreak. Their depth of filling is up to 51 mm. The profile geometry is ideal without inherent stress. There is no profile deformation in metal working. The profiles have high strength level and resistance to mechanical stress. Manufacture of outside and inside single-leaf and double-leaf doors of any size with upper or side panels or without them. Manufacture of outside and inside single-leaf and double-leaf revolving doors of any size with upper or side panels or without them. Making external and internal partitions of any sizes. VA-THERM represents design, functionality and variety. VA-THERM distinguishes itself by quality and durability owing to usage of unique materials. It complies with the highest safety requirements. Modern modular system gives a possibility to improve heat-saving properties step-by-step. 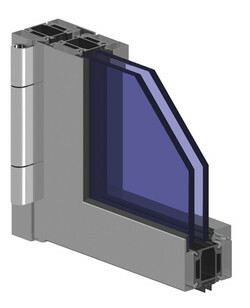 Possible glass thickness is from 20 mm to 51 mm Complies with all CE requirements.